Dar Lighting Aruba single light switched wall fitting with a polished chrome frame supporting open ended globe shaped opal glass shades. 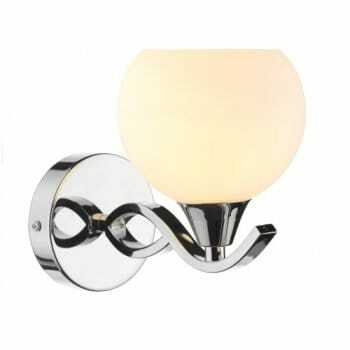 The product code for this Dar wall fitting is ARU0750. Double insulated and operated by a rocker switch located on the back plate. This simplistic but stylish Aruba collection also includes a 3 or 5 light ceiling fitting. The Aruba range includes a matching 5 or 3 light semi flush ceiling fitting all of which can be ordered on our website.